Part of the mystique of driving has often been the possibility of someday getting into a fast car, pointing it in a random direction, and just driving for the sure pleasure of driving. However, the onward march of technology that has made its way into every area of modern life has also found its way into our highways and byways. The thought of getting into your car, and just taking off is now done with a bit more caution as we consider that the roads are full of traffic enforcement cameras. A traffic enforcement camera has many names. Red light camera, traffic camera, road safety camera, road rule camera, photo radar, photo enforcement, speed camera, and so on. They are mounted beside or over a road, or installed in a law enforcement vehicle to detect drivers that are speeding, and other traffic violations. People go through a red traffic light, go through toll booths without paying, and use unauthorized bus or commuter lanes daily. Often, the traffic camera is linked to an automated ticketing system. With all the different types of enforcement cameras, people question, what’s the difference? 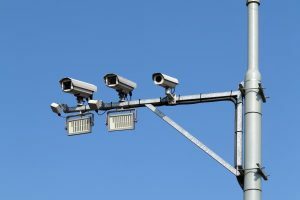 Traffic sensor cameras are the most common type of camera that are seen. They are typically installed on top of traffic signals or mounted on top of light poles above roadways. They are almost always small, cylindrical, or dome shaped. Because of their location, it’s a give away that they are not a speed or red-light camera, which are never mounted in this fashion. They are used for a few different reasons, but their primary function is to measure traffic flow and determine the timing of traffic. They aren’t tied to any law enforcement system, and typically the video isn’t archived or used for incident reconstruction. Automated number plate recognition (ANPR) cameras are cameras that are combined with AI that allows them to read license plate numbers. As with the traffic sensor cameras, they are not tied into any automated ticketing system. They are used primarily to track the whereabouts of drivers. ANPR cameras that are installed in law enforcement vehicles are always recording. They can automatically scan and cross reference license plates with government databases. The system will notify the officer if the person operating a vehicle has an outstanding warrant, for instance. ANPR cameras operate in the infrared light spectrum, allowing for better low-light sensitivity. Red light cameras, or traffic enforcement cameras, are at the top of this list. They are automated ticket-issuing systems that are typically placed at busy intersections. They are designed to detect when a motorist enters an intersection after the light has turned red. It then records multiple images of the vehicle and sends the information along to law enforcement ticketing agencies. Speed cameras operate in a similar way to red light cameras. They also automatically detect and issue traffic citations, but for speed, not red-light infractions. No matter which type of traffic camera you are designing, you want the images and videos to be as clear as possible. Universe Optics will ensure that the precision lens they craft for you will deliver the accuracy and reliability necessary for your equipment.